Back in 2001 at the non-profit organization Myvesta.org we held a contest and solicited the best cheap meals from people all cross the country. 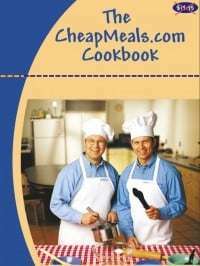 The resulting entries were combined into the Cheapmeals.com Cookbook. You can download a free copy of this cookbook below. But first, here are some great tips for eating cheap meals. 1. Get a plan. If you’re always spending more for food than you expected to, then a plan is in order. It doesn’t have to be elaborate, just sit down with your family and come up with a dozen or so recipes that are tried and true. Write down the ingredients you’ll need and stock up well enough that you’ll have plenty on hand. The fact is most people eat basically the same dishes over and over again anyway. 2. Choose just one new dish a week to try. If the family really likes it, add it to your tried and true list. 3. Keep a pad of paper handy on the refrigerator so you can write down what you’ve run out of â€” it’ll probably save you more than a few trips to the store. (Don’t forget to take the list with you!) Those last minute trips for one or two items often result in a bag of groceries that break the budget. 4. Keep a running tally of what’s in the refrigerator or freezer. You can post this list on the fridge, too. Maybe now you won’t forget about the lasagna you froze last year! 5. Clip coupons but only for items you already buy. Then, if your local store offers double coupon days, time your visit accordingly. Kids can be great coupon clippers, especially if you offer to give them a share of any money you save. 6. One of the biggest reasons we’ve heard as to why people don’t use coupons is that they always seem to be for items that you never buy. Here’s what you do: Clip the coupons for the products you don’t buy, but are made by the same company as a product you do buy. As long as the first 4 digits on the coupon match the first 4 digits on the item’s UPC code, they are made by the same company and you’ll get the discount. So if there is a coupon for diapers, and you buy paper towels made by the same company, you can use the diaper coupon to get the savings on the paper towels. Some stores allow this use of coupons and some do not. Ask the store manager if this use of coupons is allowed at the store where you shop. 7. Stock up on staples so you’ll always have the basic ingredients for a recipe. If you have the room for storage, buy plenty when the price is right but make sure that they will store well. 8. Also, stock up on your favorite items when they go on sale. If your favorite apple juice normally costs $2.29 and you buy it on sale at $1.50, you’re guaranteed to save 34 percent, taxfree. Stock up and save! 9. Let younger kids pick out one item within a certain price range (say $2) when they shop with you. They’ll learn to compare prices and hopefully won’t bug you to buy everything they see that looks good. 11. Look high and look low. The more expensive items are usually right at your level of eyesite, says Mary Hunt, publisher of the Cheapskate Monthly (www.cheapskatemonthly.com). The less expensive ones are probably up high or down low on the shelves. 12. Buy cheaper generic or store brands of staples (flour, tomato paste, etc.) Keep in mind that store brands are generally made by the manufacturers of the big name ones â€” they just slap on a different label. 13. Stick to your list and only buy promotional items when the price is really right and you’d normally buy them anyway. Otherwise, you’ll end up with a case of artichoke hearts that you’ll never use. 14. Alternate where you shop based on what’s on sale. Hit the warehouse clubs from time to time to stock up on good deals. 15. Use unit pricing. These days, most stores display unit prices on the shelf labels (the price per pound or per ounce for example). It may be in tiny type, but it’s usually there. Use that to help you figure out what’s really the best deal. 16. Stay out of stores as much as possible. If you find yourself running to the store for more milk or bread, or because you’ve run out of something, then look at your master shopping list again to make sure you’re shopping for what you need. 17. Buy in season. It sounds obvious, but buying fruits and vegetables in season can be dramatically cheaper than buying out of season. The flavor is usually a lot better, too. 18. Create a price list with the prices of items you usually buy at the stores you frequent. That way, you’ll know which stores have the best deals on certain items. You’ll also know when a “sale” price is a bargain and when it’s not. 19. Bring only your budgeted amount of cash to the store and leave your credit cards, checkbook and ATM card at home. You’ll have no choice but to stay within your budget! 20. When you make a meal, double the recipe if you can. Then save the rest for a meal later that week, or put it in the freezer. You’ll save time and money! You may even want to try making one month’s meals at once and freeze them. This method can save time and money. Get Month of Meals by Kelly Machel or Once a Month Cooking by Marilyn Wilson for details. 21. Join up with others and start a meal exchange. The idea is for four families to share cooking responsibilities. One family cooks a meal one night a week for everyone. Then the meals are either delivered that evening or exchanged at a convenient location once a week. Shopping can be a once-a-month group activity or divided among the group’s members. 22. Become a master at substituting. For example, Nancy Castleman, editor of The Pocket Change Investor newsletter (goodadvicepress.com), substitutes shelled sunflower seeds for expensive pine nuts in her pesto. It tastes delicious. A powdered egg substitute that can be used in place of eggs in most baking recipes is available at health food stores. Keep your eye out for other inexpensive ingredients that can work just as well as more expensive ones. 24. Have a “leftover” night on Friday or Saturday where you eat what was left from the week. Make it a family fun night with plenty of games and conversation and the kids will probably get into it. 25. Start a small herb garden in your window or on your patio. Herbs will be there when you need them and will be much less expensive than buying them fresh at the store (potted herbs also make wonderful, inexpensive hostess gifts). 26. Learn to cook. If your idea of making dinner is to pick up the phone, invest in a few cooking lessons or learn from a friend or relative. You may surprise yourself and your family! Author: This article was contributed by GetOutOfDebt.org, a site that provides free help and debt advice on how to get out of debt.